Puma's princess Rihanna has become a sensation with the launch release of The Creeper model, a month has passed and the new series has emerged. Puma x Rihanna collaboration continues with set 2 of the famous suede high lift soles. This time they will bring more of a soft tone cream color touche and vibrant mixture with a rose, off white cream, and mint blue. As this shoe reminds us of the Punk 90's, women everywhere are making the new sneaker a present masterpiece that will be told for years to come. The sneaker will feature a premium nubuck suede on each upper and wax laces for durability. It will have gold accents endorsing the Rihanna partnership and Puma branding, gold lace tips, and the new high lifted sole for a women's touch. Closing with a solid black packaging. It is probably not over to say the least, since more colors have been surfacing around the net for the Rhianna collab with Puma, but one thing i have noticed is that each series will have one specific color people are hunting for and loving the most. All you have to worry about is hit up our Long Beach location for your chance to cop. They will be released tomorrow on a first come first served basis, for more info contact a store. thanks for stopping by please Like, Share, and Comment. Stay Fresh ! Puma and Detroit's boutique Burn Rubber will collaborate for the first time, releasing a dressed up sneaker with custom packaging. All the work is to pay a special homage to the tallest rail station of our time. The Michigan Central Station or also know as Michigan Central Depot (MCS). This transportation headquarters will replace the old Downtown Detroit rails, it formally opened on 1914, and closed on 1988 do to the Amtrak service. It was a major import & export center, and also was a passenger router.The building is located in the heart of Crock town as a major tourist attraction and heritage of Detroit. The shoe will be design base on the buildings marble and stone fixtures, as well as it's terrazzo flooring. Stepper's will be conducting a premium leather body over all with a mixture of navy and powder blue. the inner lining will be build of brown leather with a suede khaki matching outer top crown. custom insoles will be giving respect to the flooring and boutique shop burn rubber logo, the branding will also be visible on the back heel of the shoes. The Puma strip will conduct a pure green on matching eyelids. wax laces will put everything tight on your feet. It will show the words that will commemorate the MCS "Over 100 years and still standing" ! Finishing with a custom traveler's packaging box to hold down the story strong. Burn Rubber has not disappoint with work collaboration throughout the years. This first Puma Collab is no exception. Make sure you hits us up to get your pair, doors opened at 10 am. Thanks to Gio for blogging strong. Don't forget to Like, Share, and Comment, Stay Fresh ! BAU x Puma R698 "Eat What You Kill"
As the street culture movements continues in Boston, their is now way we can't notice it without the name of Frank the butcher being mentioned. The native has been a street mind on music, design, and fashion. He has worked on productions, inner designed with different associations or brands. Also worked on fashion with BAU, his clothing line which means Business As Usual. He will collaborate with PUMA and release his next project EAT WHAT YOU KILL, this model R698 will release on Fri the 30th. These shoes will be mixing a presence of Leather and Suede on the body, combining a charcoal grey in black. Accents of Yellow with Red will hit the body. It will be custom with a Frank The Butcher logo in the inner sole and will hit the BAU branding on the tongue. It will sit atop a white mid-sole and brings the new tradition with shoes and extra lace to combine three options Grey Yellow or Black. As the saying goes Business As Usual, so if you miss out that will be your own business to try to cop a pair. The shoe will be available on a first come first served basis exclusively at out Long Beach location, Thanks for sharing liking and commenting, stay fresh ! BAU x Puma Blaze Of Glory "Eat What You Kill"
As the street culture movements continues in Boston, their is now way we can't notice it without the name of Frank the butcher being mentioned. The native has been a street mind on music, design, and fashion. He has worked on productions, inner designed with different associations or brands. Also worked on fashion with BAU, his clothing line which means Business As Usual. He will collaborate with PUMA and release his next project EAT WHAT YOU KILL, this model Blaze of Glory will release on Fri the 30th. 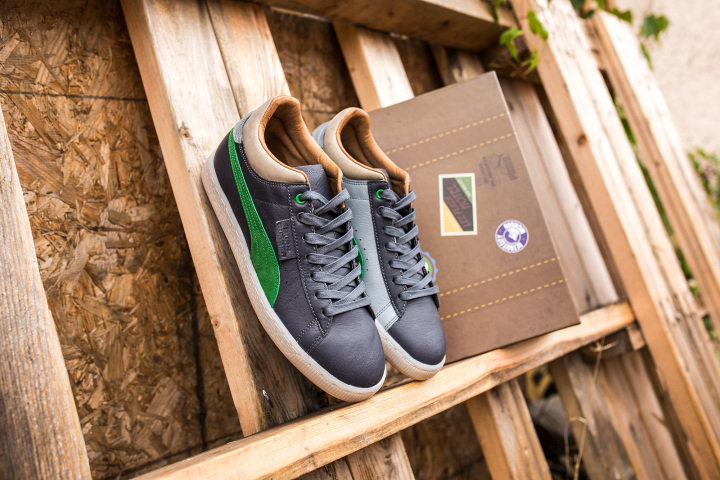 These shoes will be mixing a presence of Leather and Suede on the body, combining a charcoal grey in black. Accents of Yellow with Red will hit the body. It will be custom with a Frank The Butcher logo in the inner sole and will hit the BAU branding on the tongue. It will sit atop a white mid-sole and brings the new tradition with shoes and extra lace to combine two options Grey or Yellow. 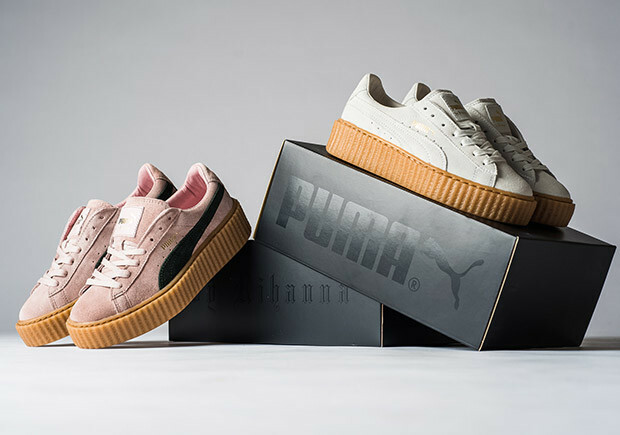 Puma Suede x Rhianna Fenty Collection "Creeper"
Announced by Puma in December 2014, that Rhianna Fenty will be playing a direct designing role on the Puma Company, it is a year later and the collaboration finally surfaced. Introducing THE CREEPERS by Puma 'Fentry'. The company will keep the last name of Rhianna branded and they will join forces to remix or re-design the classic suede. This classic model will take a New York Punk cultural look and will come with an enhanced platform. Rhianna is famous for being a singer, songwriter, actress, and fashion designer. Although she has only tackled clothing, she will make a transition to the sneaker culture. We can all say it will be a breeze since her first shoe is completely SOLD OUT on the Puma.com website. This RiRi x Puma collab will come build on a premium suede upper body, the side will have gold engraved suede and puma logos to match perfectly with the gold lace locks. The bottom sole will be transformed from it's original style to a platform NYC punk look, closing with a partnership branding on the tongue. The Barbados Queen RiRi, will launch her partnership this following Friday September 25th at Long Beach location only, commercials videos are leaking and make sure you check out the preview I set specially for my bloggers on the bottom of Shots. This sneaker will be available on a FCFS basis and for questions contact our store by clicking above. Thanks for stopping by and remember to Like, Share, and Comment. Stay Fresh !